Finding tour groups posing for photos was a common sight in Japan. Note the tour guide in the center of the photo with the yellow sign. That was actually a flag she carried and held aloft to keep the the group together. The man in the bright yellow coat was also a guide for this group. 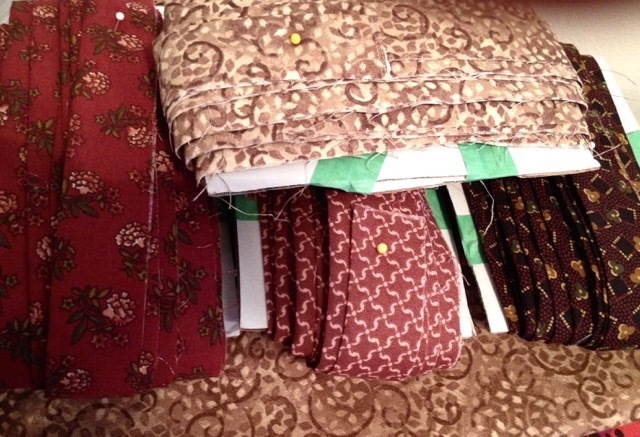 Last week while cleaning my sewing room, I found some backing scraps. Usually these scraps are large enough to be used for pillowcase cuffs, so I searched my stash to find coordinating fabric for the body of the pillowcase. Who knows why I purchased the striped green fabric, but it is now out of my stash. The nice thing about Quilt of Valor presentation cases is that they do not have to match the quilt, as their main purpose is to protect the quilt when in storage. These ten cases used approximately 10 yards of fabric - a nice addition to my Slash the Stash challenge. I need at least 400 yards to knit a pair of size 10 socks, so some single, 150 - 168 yard skeins are repeatedly stuffed back into the yarn bins. The Slash the Stash challenge is forcing me to look for ways to use the previously rejected yarn. This pair of socks will not match because of the variegated yarn. With any luck, they should be off of the needles by the next week. Typically, I knit socks with a 56 stitch count, but since this yarn is a bit thicker, I am using a 64 stitch count. 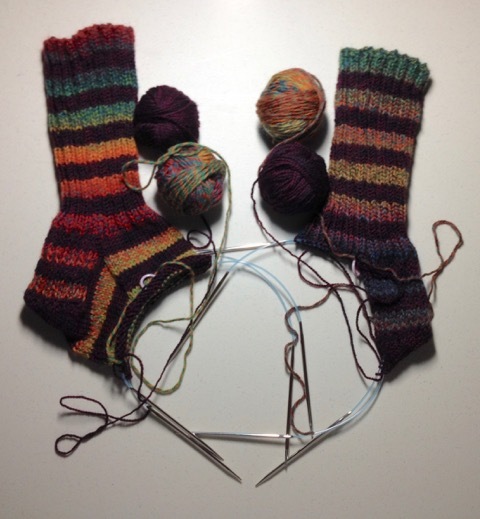 I found this great source for turning the heel for a multiple of stitch counts (40 - 80 stitches). Heels by Number not only has a variety of stitch counts but also for six types of heels. What type of heels do you normally use when knitting socks? While organizing scraps in December, I found some orphan quilt blocks. Luckily, I had just enough of the rail fence blocks left over from Stars of Stripes and Firecrackers to frame the center panel of Land of the Free. Last Monday, two Quilts of Valor (QOV) arrived from the longarm quilter, but before I could call them finished, I had to add the binding and label. 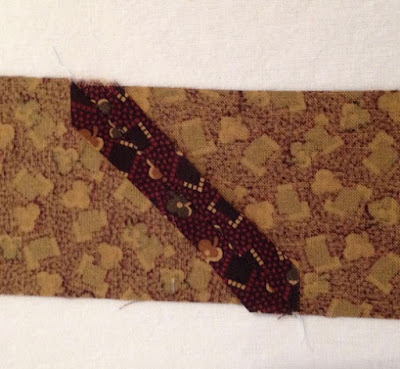 The binding was already prepared and just needed to be sewn on the front of the quilt before I began the tedious task of hand-stitching it to the back. The hand-stitching is my least favorite parts of quilting, but the Sewline needle threader (shown above) makes the job more enjoyable. According to a USPS tracking number, a box should be delivered this afternoon that contains two QOV from a longarmer in South Dakota, so more binding will be done this week. 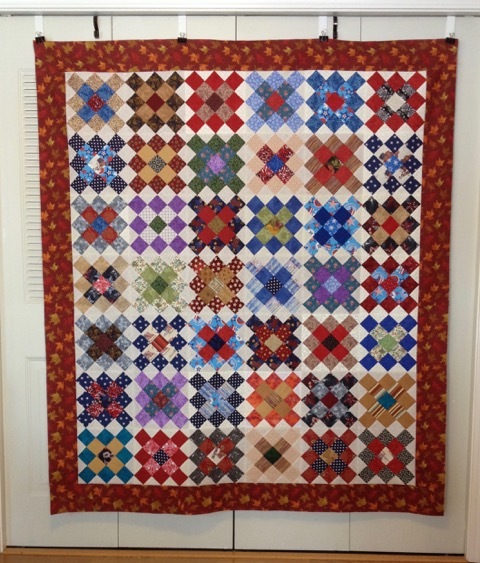 A longarmer in Montana has two quilts and will return them in the next two weeks, and the most recent QOV are ready to send to an assigned volunteer longarmer. 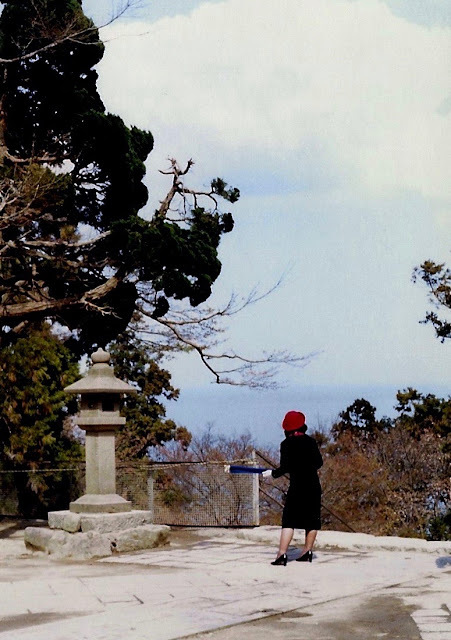 The world was much different 36 years ago, but a part of me hopes that Bus Ladies are still part of the tourism scene in Japan. They were classy and professional. Previous posts can be seen here and here. Have you noticed all the adult coloring books on the magazine racks and in craft catalogs? I love to color but haven't purchased any of the books. I prefer to color with crayons and many of the drawings in the books are too detailed for crayons: colored pencils work the best. Last week, I discovered the free printable (shown above) for Valentine's Day cards on The Craft Patch. I downloaded the files and will try coloring it with crayons. Should you want to join the "coloring trend," the free PDF for the cards can be found here. 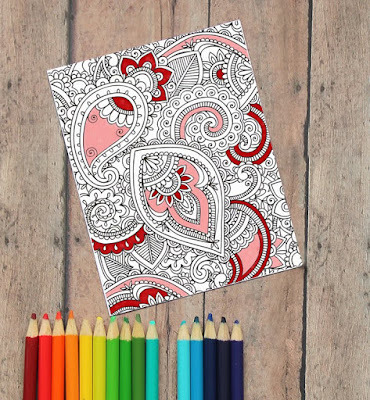 Craftsy is offering a free, eleven page adult coloring book here - be patient, it's a big file, but the prints are good quality. Craftsy is a very nice site where you can find patterns (quilts, crochet, knitting, sewing, etc.) and purchase supplies and kits. 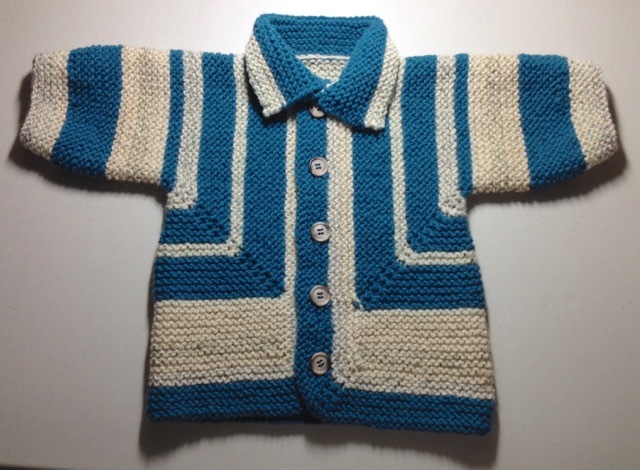 The site offers free and for-purchase patterns. Any patterns you downloaded are also saved on their server on an account that you create which is nice, too. Loveknitting has a small free book of fiber-related pictures to color - the prints are a bit fuzzy, but would still be fun to color. You can find the link to the PDF here. 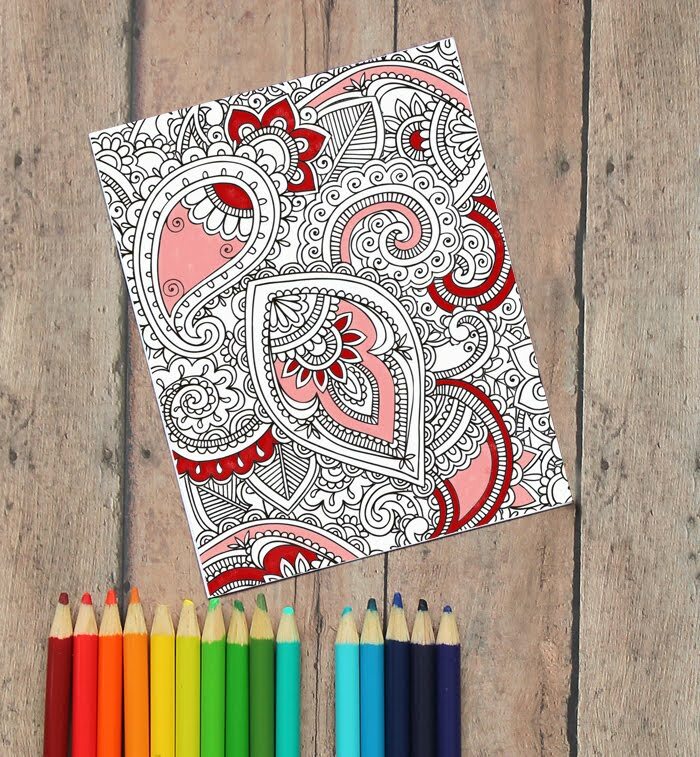 Have you purchased an adult coloring book? 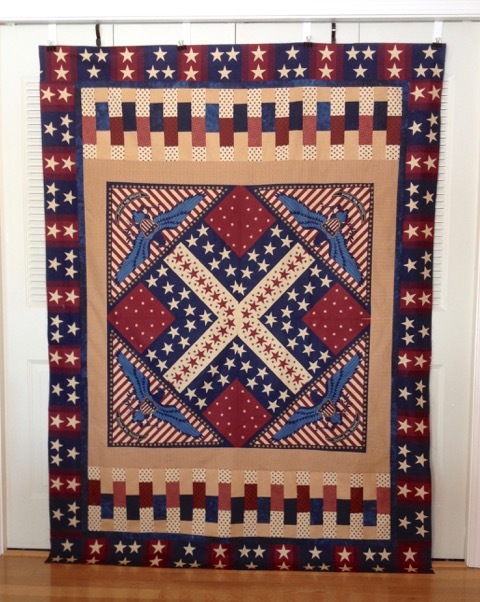 United We Stand is Quilt of Valor #85 - complete list can be seen here. The center of this top is a four-piece panel by Andover Fabrics, and it was a bugger to use. The main problem (other than not being square) was the star on the navy blue section that meets at the center seam. I bet every person who has used these panels has cursed that one star. Even the photo on the free pattern, shows it is nearly impossible to match the pieces. I probably should have made one of the alternative patterns for the panel, but I didn't know they existed until I was nearly finished. Despite the funky stars near the center, this is one of my favorite quilts: I love the pieced border and will probably use that on another quilt. Last week, I mailed six quilts to volunteer longarm quilters, so when they are returned, I will be kept busy attaching the binding. The six quilts were: Gemstones, Simply Stars, Calico Stars, Open Windows (all finished in 2015) and Fiesta and Blue Lagoon (finished in 2016). I never met my paternal grandmother, but thanks to my Aunt Sadie, I do have a few photos of her. Annie was born and raised in England. She had two brothers (William and Harry) and two sisters (Matilda and Ada). Most of her relatives in England worked at a deaf and dumb asylum: her father was a porter at the asylum. Annie worked there for 13 years. When Annie was 31, she sailed to America with her sister and brother-in-law in September 1899. They ended up in Brewster, MN where their Aunt Sarah lived. While in Brewster, Annie met and married my grandfather John, who was a natural-born citizen, which automatically made Annie a U.S. citizen. 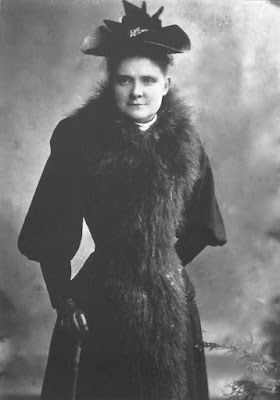 Annie died on January 7, 1950 at the age of 82. An earlier post about my paternal grandfather can be found here. 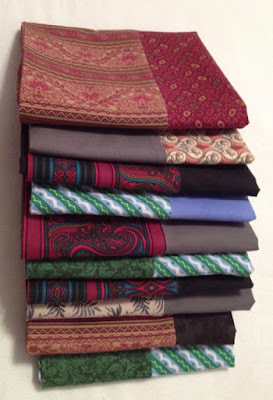 After Christmas, I found some great bargains on Craftsy for quilt kits. I rarely purchase pre-cuts, but the price (less than $30) was too good to pass. Blue Lagoon was made from one batik "layer cake" (40 - 10-inch squares) from the Tonga Treats line. Because I didn't want any scraps, I didn't use the pattern that came with the kit. I separated the squares into two piles - lights and darks - and then paired them to make half-square triangles (HSTs). The HSTs were randomly arranged the blocks to create Blue Lagoon. 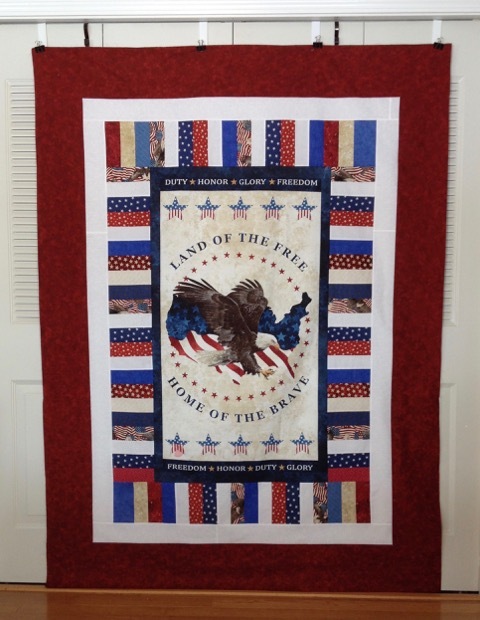 Blue Lagoon is Quilt of Valor #84 - complete list can be seen here. The Richard Bong Theater was one of two movie theaters on base. The Bong was near the Base Exchange on the main base, and the other theater was on The Hill. The archway kept those waiting to purchase tickets dry in the relentless rain during the typhoon season and warmer when the snow was falling and blowing sideways. At the beginning of every movie the National Anthem was played while the audience stood at attention. One time the recording stopped abruptly, and without hesitation everyone began singing where it left off. 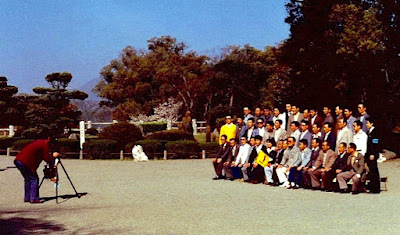 The high school did not have a stage or theater; thus, my drama students staged their plays in the Officers' Club - Club Mutsu. 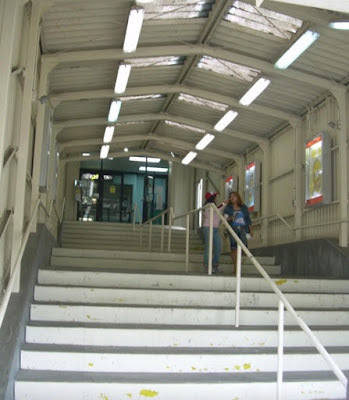 In 1980, when that building was not available, I made arrangements for Twelve Angry Men to be performed on the Bong Theater stage one afternoon. The stage was actually quite large and worked well for the performance: I wish it would have been possible to stage our plays there all the time. Information about Richard Bong can be found here. Fiesta, the first Quilt of Valor (QOV) finish for 2016, was created with the granny square blocks that I was working on in this December 17th post and this December 29th post. 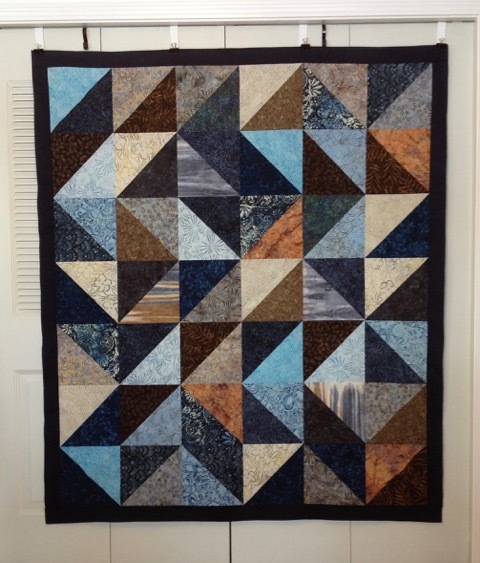 Once the blocks were finished and trimmed, the quilt top came together quickly. I decided not to use sashing like I did with Treasure Chest and Gemstones. 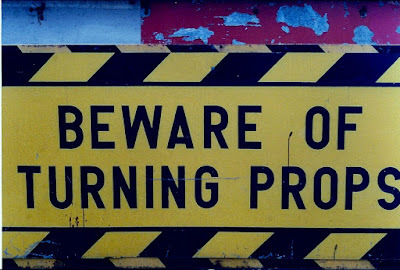 Over the extended, holiday weekend, I worked on a project that had been stalled since October. It is now finished, and I am delighted with the shawl and have been wearing it around the house since it came off the needles. It is a short shawl (18.5 inches at center back), and hits me just a bit below the elbows: a good length for keeping the chill off, but not long enough to be in the way when working or knitting. 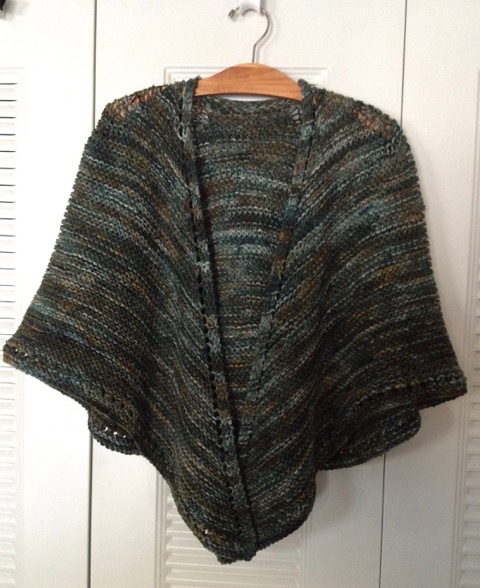 The shoulder shaping keeps the shawl neatly in place without any fussing or tugging. I've worn this shawl every day since it came off of the needles over a week ago. I love it! 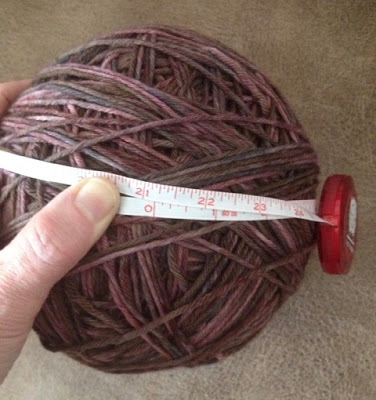 From the original 1.3 pound ball of yarn, only 3 oz. remains, which will be enough to knit a hat for the donation box. Remember the purple yarn ball in the original post about the shawl? It is currently being knit into another Faroese shawl. 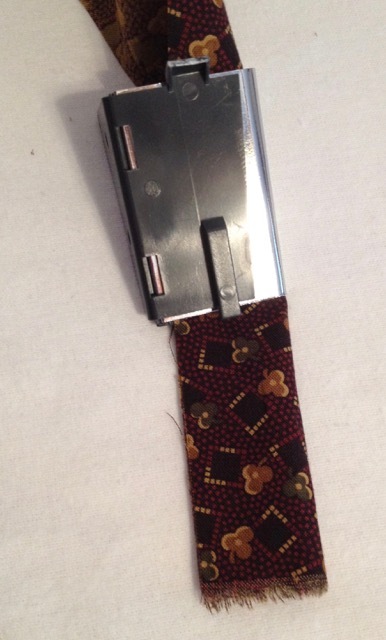 Yes, indeed, this pattern is a keeper. The four Quilts of Valor tops, finished before Christmas, needed to have backs and bindings prepared, so over the weekend I tackled that job. I like to use scraps from previous backs for the binding because the pieces are usually long and on the straight of the grain. Whenever I prepare binding, I thank Lori for telling me about a wonderful tool that makes pressing the binding quick and painless. 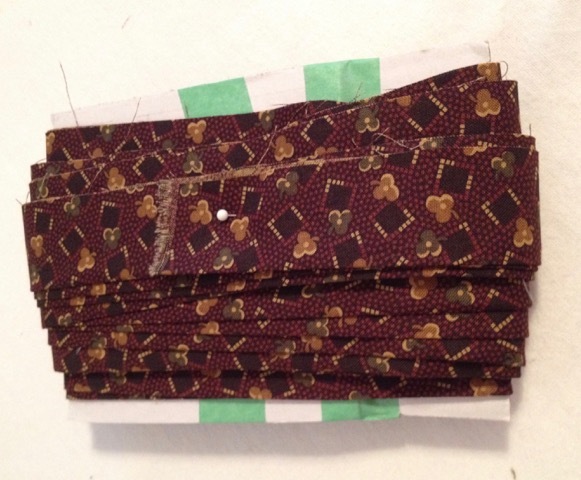 After the 2.5 inch strips have been cut and sewn together, the seams are trimmed and pressed open. Before Lori told me about the 1.25 inch quilt binding tip, shown above, I had to fold the fabric in half while pressing. This process resulted in hot or burned fingertips. 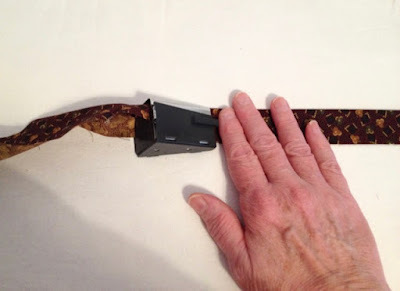 The quilt binding tip takes all the discomfort out of the process, and I can prepare the binding in less than half the time. Carefully insert the fabric in the curved slip on the back of the tip. It is easier to do if you leave the selvage on the fabric. 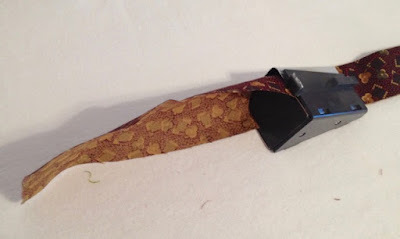 Gently push the fabric through the slit until it is visible at the opening on the flat side of the tip. At this point, I use my stiletto to work the fabric down to the end of the tip. Once the fabric is through the tip, gently straighten it until the two layers are folded perfectly in half. Press the end of the fabric and gently draw the tip to the left. 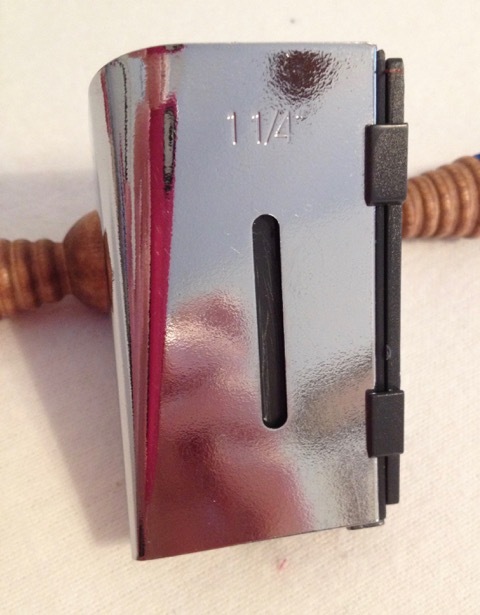 Now, you are ready to press and prepare the binding. Press the fabric as you gently draw the tip to the left. 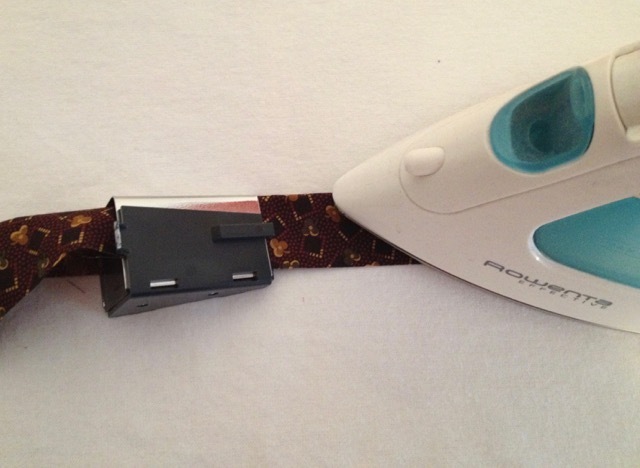 The shiny flat edge of the tip should be against the ironing board, and it will glide smoothly. When you reach the end of the ironing surface, move the pressed binding off of the board, so you can continue pressing the strips. I usually prepare 7 - 8 strips of 2.5 inch fabric for the Quilt of Valor binding, so there are several seams. 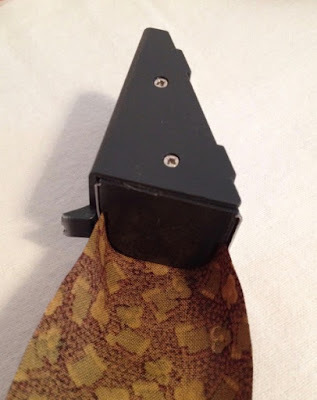 The seams may be tight in the binding tip, so you will need to place your right hand on the pressed fabric, and then gently tug the tip over the seam. Continue pressing until you reach the end of the fabric strips. When the full length of the binding has been pressed, I wind it on a piece of cardboard and secure with a pin until it is needed. 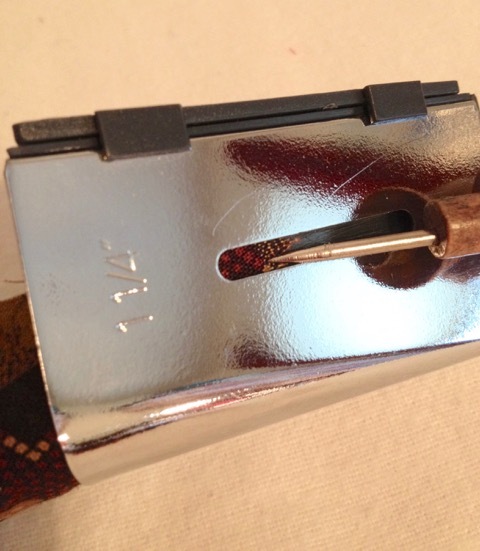 I no longer dread making binding thanks to Lori and this simple tool. 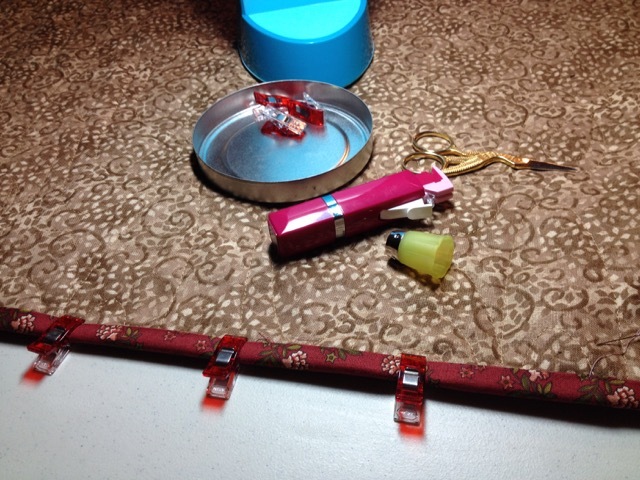 Note: the tip can be found online, in larger quilt shops or even in hobby stores that sell fabric. Amazon gives you the specific details and an idea of price - as I illustrated in this post, you do NOT need to purchase the Bias Tape Maker machine to use this tip to prepare quilt binding. I had a blast knitting this BSJ with the Noro Kirara yarn: the bright Noro colors kept me motivated. I used two completely different skein colors, but the Noro colors complement each other so well, it works. For the record, the skein change was at the end of the red and beginning of the turquoise stripes. Knitting notes and specifics can be found here. Another project for the donation box, and two more skeins slashed from the stash. Not a warning the average person would see, but extremely important if you are walking on the flight line. 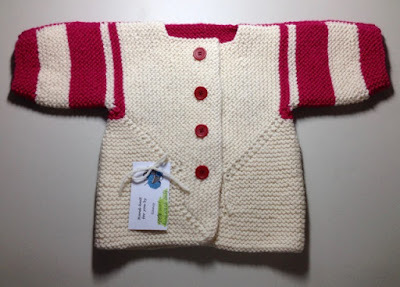 A collar has been added and buttons attached to the Thrifty Baby Surprise Jacket, so it is officially finished. I love knitting this pattern and always delight in how the gangly blob magically turns into a cute sweater with only two seams (at the shoulders). 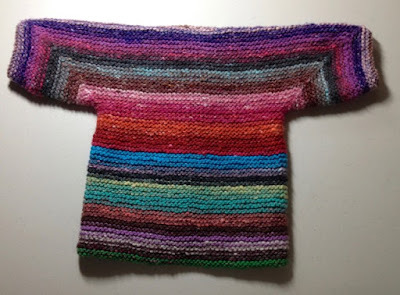 Elizabeth Zimmerman was a knitting genius and created many delightful patterns; however, I simply cannot could follow her original, "pithy" patterns. I am not what she would call an intuitive knitter: I need row by row directions. Obviously, I am not alone, as Schoolhouse Press adapted the original Baby Surprise Jacket pattern (BSJ) for all non-intuitive knitters. You can find the pattern here. 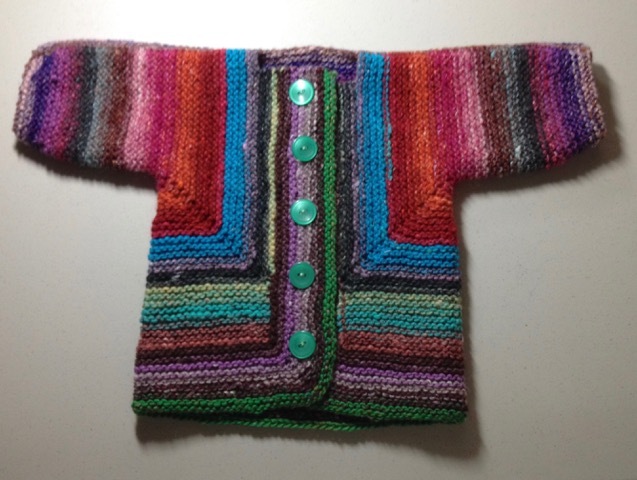 Knit just one BSJ, and you will be hooked. 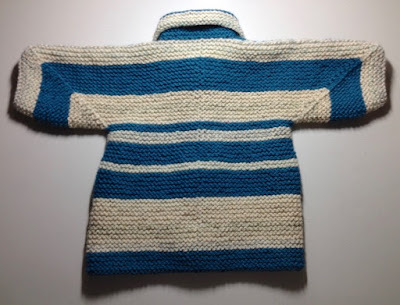 I'm embarrassed to admit that the following BSJ came off the needles in 2014; however, the shoulder seams were not done and buttons not attached. I had hoped to find some yarn that would work for a collar; I didn't. 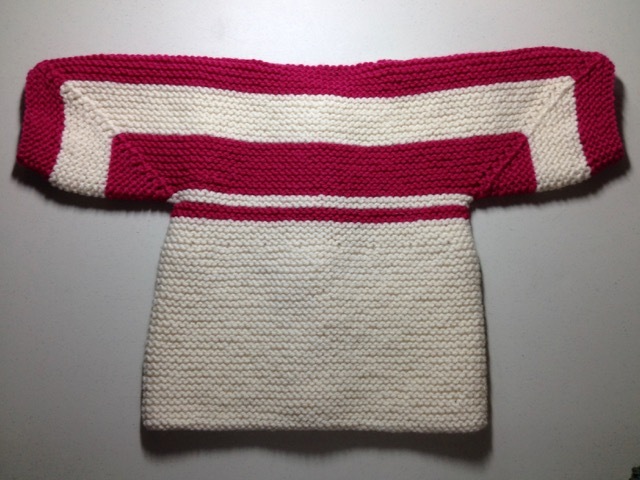 The sweater was stuffed in a bag, unfinished. It was time that was rectified. Here is the BSJ, sans collar. Both BSJs are now in the donation box. These are the first finished projects in the Slash the Stash challenge. 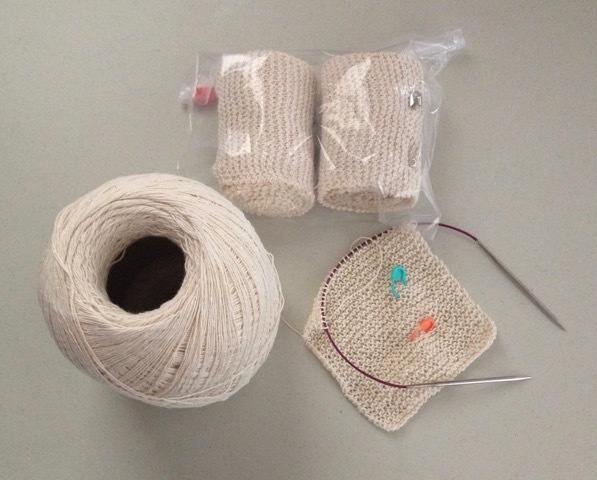 Several weeks ago, I posted about the Bandage Brigade, and the knitting for that project is on-going. 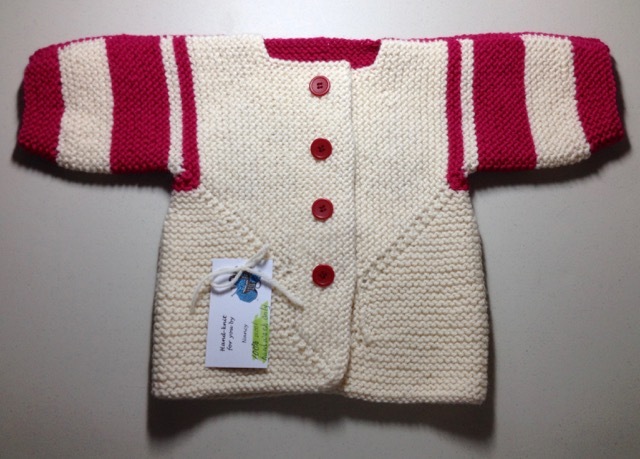 It's the perfect project to take to knitting night because it doesn't have a pattern that requires my concentration. As you can see by the size of the ball of thread in the photo, this is another Slash the Stash project. If my calculations are correct, that ball should be adequate to knit 7 additional bandages.